Since the release of failed presidential candidate Hillary Clinton's book, "What Happened," we have seen a constant stream of statements and interviews as Clinton participated in book signings and opined ad nauseam on all the reasons she believed she lost the 2016 president election to Donald Trump, as well as weighing in on almost every political issue in the news, while on her book tour. On October 16, 2017, scheduled interviews were suddenly cancelled or delayed due to an 'accident" where Clinton claims to have fallen and broke a toe. 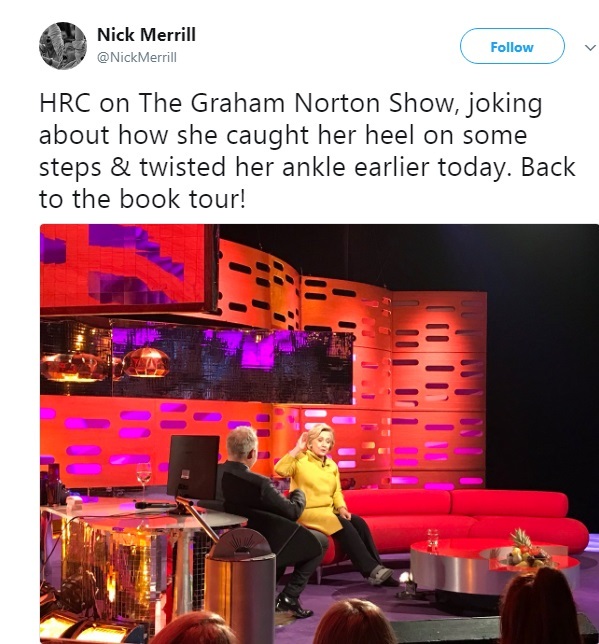 Most of the interviews were cancelled, with her scheduled interview with BBC's The Graham Norton Show delayed and finally taped, as her spokesman Nick Merrill, tweeted a message stating "HRC on The Graham Norton Show, joking about how she caught her heel on some steps & twisted her ankle earlier today. 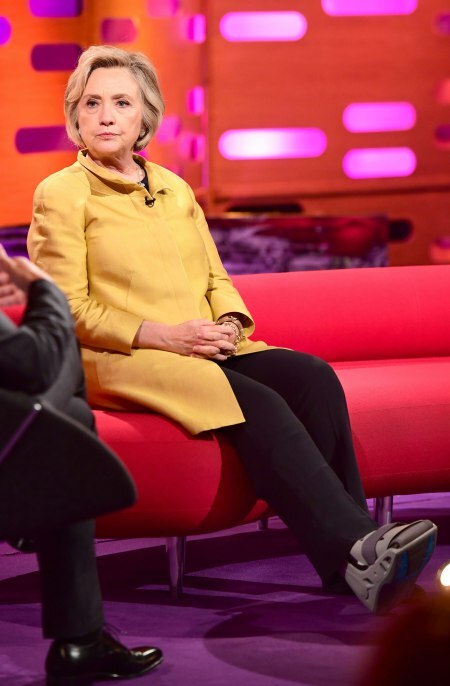 Back to the book tour!," along with a picture of Clinton sitting on a couch for the interview, wearing a special boot on her foot. Later she claimed it was a broken toe. Back to the book tour he said...... yet, after daily reports of said book tour for the past few weeks, Clinton seemingly disappears from the spotlight after her delayed appearances on the 16th, other than an article over at The Economist dated October 17, 2017, regarding a podcast interview, but in following the link, that interview came out on the 16th. Keep those dates in mind. As ANP addressed on October 18, The Hill published a blockbuster report that has the internet, and Congress buzzing on a controversial deal in 2010 giving Moscow control of a large swath of American uranium ro Russia in the midst of criminal investigations which included bribery, kickbacks, extortion and money laundering, as well as information stating "Russian nuclear officials had routed millions of dollars to the U.S. designed to benefit former President Bill Clinton’s charitable foundation during the time Secretary of State Hillary Clinton served on a government body that provided a favorable decision to Moscow"
The story implicated the Obama administration, Hillary and Bill Clinton, the Clinton Foundation as well naming key investigators into the Russia/Uranium One criminal activity case, like then-Assistant FBI Director Andrew McCabe, now the deputy FBI director under Trump, then-U.S. Attorney Rod Rosenstein, an Obama appointee who now serves as President Trump’s deputy attorney general, former FBI Director James Comey and former FBI Director Robert Mueller, now the special counsel in charge of the Russia collusion investigation. A huge story no doubt, but within that article, the writers John Solomon and Alsion Spann, make it clear the spokesman for Clinton "did not return calls seeking comment," meaning they notified Clinton's people and asked for a comment to this huge new bombshell report, before the it was published on the 17th. Hillary Clinton knew before the 17th that a scandal involving her and the Clinton Foundation was getting ready to break before she had her "accident" and cancelled a bunch of interviews on the 16th. The only thing found so far by way of a public statement by Hillary Clinton, since her interviews on the 16th, was a tweet from 8:45 am on October 17th, linking to a CNN story about a hospital ship being empty in Puerto Rico, where Clinton or her social media people wrote "This is a disgrace. American citizens need America’s resources. Now." Remember, this is a woman who has weighed in on almost every decision, action, comment or issue in the news, since she came out of the woods after losing the election, yet she is completely silent on what is arguably one of the biggest "Russia" scandals exposed to date? Granted, over the years Hillary Clinton has had a number of falls and injuries documented, leading many to question her health during the 2016 presidential election, but the sheer coincidence of an "accident" occurring after her people and obviously Clinton herself, became aware of a major scandalous article that was set to be published implicating her in possible racketeering, but before the article went live, where she then cancelled and/or delayed a number of interviews the day before the article came out, and we can find no new interviews or statements from Clinton in the days following it, seems to be worth mentioning. According to Media Research Center, the Big Three (ABC, CBS, NBC) network gave the Clinton/Russia/Uranium scandal a total of "zero seconds," as of Thursday morning. 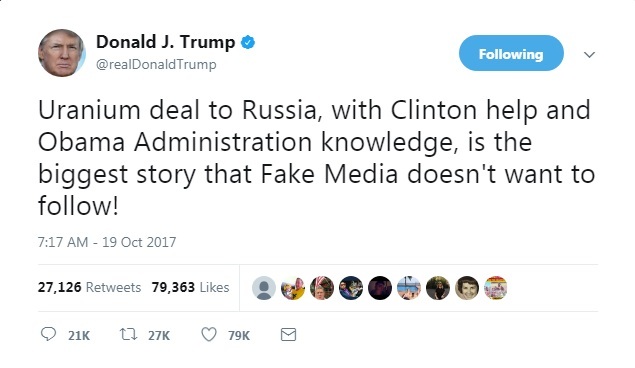 president Trump addressed that on Thursday as well, stating "Uranium deal to Russia, with Clinton help and Obama Administration knowledge, is the biggest story that Fake Media doesn't want to follow!" We wonder, when Hillary Clinton does pop up again like a bad penny, if anyone will even bother to ask her about it on record or if she will even appear for any interviews without first demanding that no questions regarding this latest scandal be asked of her. She has some 'splainin to do. Below: Fox News Judicial Legal Analyst Greg Jarrett on whether Hillary Clinton accepted bribes during the uranium deal with Russia and the Clinton email investigation.